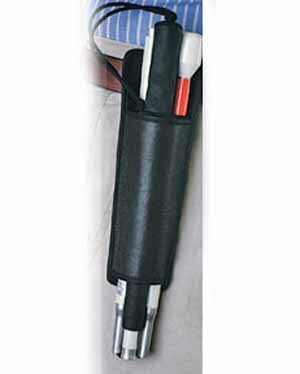 The Ambutech Mobility Cane Pouch keeps your folding mobility cane stored safely and conveniently at fingertip reach. Cane sits in the pocket securely and will not fall through due to the tapered design. Includes a belt loop and a clip to attach it to clothing, a bag or backpack strap, etc. Measures approx. 9" long, V-shaped pocket, open bottom. Works with 4 section canes. If you have any questions about this product by Ambutech, contact us by completing and submitting the form below. If you are looking for a specif part number, please include it with your message.